A self-professed home economist shares ideas on saving money while providing her family with healthy meals by using sales, coupons, and stockpiling. You can find the current menus HERE and the grocery list HERE. Please let me know if you have any problems downloading these pages. Enjoy! 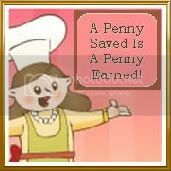 Go HERE to view an article on how to set up your own Penny binder! I LOVE UPROMISE! & you will too!